Not a joke; not a sit com; not a new version of toy story -- how the heck does this happen? 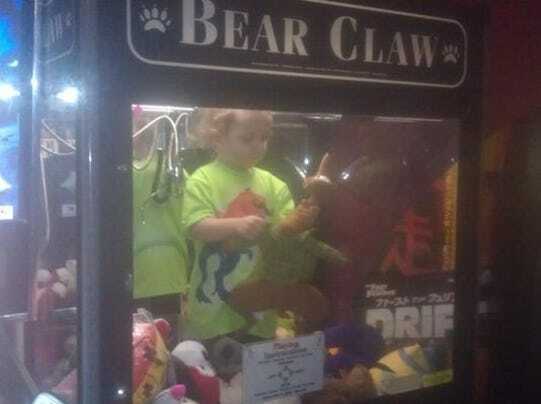 A 3-year-old boy who went missing from his home was found inside a toy claw machine in a bowling alley. The boy's mother called Lincoln, Neb., police Monday to report her son had gotten out of their apartment while she was in the bathroom, said Katie Flood, spokeswoman for the Lincoln Police Department. Police canvassed the area and were notified by a man that a boy was inside the claw machine, Flood said. The boy only could have gotten into the machine through the prize hole, reports KLKN-TV in Lincoln. "You have to weave your way in and out, so he had to work pretty hard to get in there," said Jim Lakey with VVS, the owner of the machine, in an interview with KLKN-TV. He added, "It's kind of a rarity." The boy was not paying attention to anyone outside of the machine "because he was just picking up stuffed animals and putting them down where they come out of," Rachell Hildreth, a bartender at Madsen's Bowling Alley and Billiards, told KLKN-TV. So, did they have to use quarters to get him out? No, Lakey came to the rescue with a key to the machine, KLKN-TV reports. The boy was uninjured and allowed to keep one of the stuffed toys from the machine, the station reports. I saw a video about 9 months ago where a child entered the bottom slot and wormed his way up this same machine to get to the toys. The mother was right there, talking to someone just around the corner. It's probably still on u-tube. How many tries with the claw did she need to get her kid back? Or did she? how do they even think of that? I really like the part about them giving the kid one of the toys. Way to encourage the child to do it again.